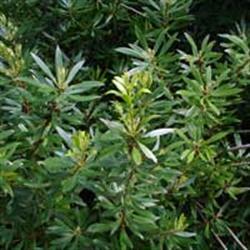 This large evergreen shrub is native to the coasts of California, Oregon, and Washington. The foliage is glossy and somewhat fragrant. This is a fast grower and it can be used for an informal hedge or screen, or clipped for a more formal hedge.